by Coey, J. M. D.
Material type: Book; Format: print ; Literary form: not fiction Publisher: Cambridge : Cambridge University Press, 2009Availability: Items available for loan: Central Library, BUET [538.3/COE/2009] (1). by Russel, W.B; Saville, D.A; Schowalter, W.R. Edition: 1stMaterial type: Book; Format: print ; Literary form: not fiction Publisher: Cambridge Cambridge University Press 1989Availability: Items available for loan: Central Library, BUET [541.345/RUS/1989] (1). Material type: Book; Format: print ; Literary form: not fiction Publisher: New York : Cambridge University Press, 1995Availability: Items available for loan: Central Library, BUET [541.37/BRU/1995] (1). Edition: 1st ed.Material type: Book; Format: print ; Literary form: not fiction Publisher: Cambridge : Cambridge University Press, 1989Availability: Items available for loan: Central Library, BUET [620.14/SEG/1989] (1). by Drazin, P. G; Reid, William Hill. Edition: 2nd ed.Material type: Book; Format: print ; Literary form: not fiction Publisher: New York : Cambridge University Press, 2004Availability: Items available for loan: Central Library, BUET [532.5/DRA/2004] (2). Edition: 1st ed.Material type: Book; Format: print ; Literary form: not fiction Publisher: New York: Cambridge University Press, 2002Availability: Items available for loan: Central Library, BUET [005.13/MIT/2002] (2). Edition: Second edition.Material type: Book; Format: print ; Literary form: not fiction Publisher: New York: Cambridge University Press, 2011Availability: Items available for loan: Central Library, BUET [174.962/WHI/2011] (2). by Dean, Robert G; Dalrymple, Robert A. Material type: Book; Format: print ; Literary form: not fiction Publisher: New York : Cambridge University Press, 2002Availability: Items available for loan: Central Library, BUET [627.58/DEA/2002] (1). by Motwani, Rajeev; Raghavan, Prabhaka. Edition: 1st ed.Material type: Book; Format: print ; Literary form: not fiction Publisher: Cambridge Cambridge University Press. 1995Availability: Items available for loan: Central Library, BUET [004.015192/MOT/1995] (2). by Otsuka, K; Wayman, C. M.
Edition: 1st ed.Material type: Book; Format: print ; Literary form: not fiction Publisher: Cambridge New York Cambridge University Press, 1998Availability: Items available for loan: Central Library, BUET [620.1/OTS/1998] (1). by Oliver, Dean Stuart; Reynolds, Albert C; Liu, Ning. Edition: 1st ed.Material type: Book; Format: electronic ; Literary form: not fiction Publisher: New York: Cambridge University Press, 2008Availability: Items available for loan: Central Library, BUET [553.2801515357/OLI/2008] (2). Edition: Ist ed.Material type: Book; Format: print ; Literary form: not fiction Publisher: New York : Cambridge University Press, 2005Availability: Items available for loan: Central Library, BUET [620.1064015186/DAT/2005] (2). by Birks, N; Meier, G. H; Pettit, F. S.
Edition: 2nd ed.Material type: Book; Format: print ; Literary form: not fiction Publisher: Cambridge: Cambridge University Press, 2006Availability: Items available for loan: Central Library, BUET [620.11217/BIR/2006] (2). Material type: Book; Format: print ; Literary form: not fiction Publisher: New York ; Cambridge University Press, 1991Availability: Items available for loan: Central Library, BUET [823.8/KRA/1991] (2). by O'Brien, Patrick Karl; Quinault, Roland E.
Edition: 1st ed.Material type: Book; Format: print ; Literary form: not fiction Publisher: New York : Cambridge University Press, 1993Online Access: Click here to access online | Click here to access online Availability: Items available for loan: Central Library, BUET [338.0941/O'BR/1993] (2). by Tadmor, Ellad B; Miller, Ronald E.
Edition: 1st ed.Material type: Book; Format: print ; Literary form: not fiction Publisher: New York Cambridge University Press 2011Online Access: Click here to access online Availability: Items available for loan: Central Library, BUET [620.10151/TAD/2011] (2). Edition: 3rd ed.Material type: Book; Format: print ; Literary form: not fiction Publisher: Cambridge: Cambridge University Press, 2007Online Access: Click here to access online | Click here to access online | Click here to access online Availability: Items available for loan: Central Library, BUET [001.6424/PRE/2007] (2). Material type: Book; Format: print ; Literary form: not fiction Publisher: New York : Cambridge University Press, 2010Availability: Items available for loan: Central Library, BUET [665.5/ZOB/2010] (1). Checked out (1). 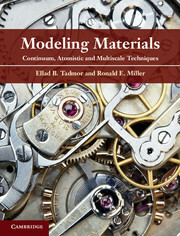 by Birks, Neil; Meier, Gerald H; Pettit, Fred S.
Edition: 2nd ed.Material type: Book; Format: print ; Literary form: not fiction Publisher: Cambridge, UK ; Cambridge University Press, 2006Online Access: Click here to access online | Click here to access online Availability: Items available for loan: Central Library, BUET [620.11217 BIR/2006] (2).